A man in the early stages of Dementia wants his home town of Torbay in Devon to become "dementia friendly". Norman McNamara, a member of Torbay Dementia Action Alliance (TBAA), wants shops and businesses to recognise signs of the illness and help customers. He said he wants the resort to back the campaign and eventually advertise it to potential holidaymakers. Torbay District Council said it supported the idea and could see both the resort and visitors benefiting. Mr McNamara said he came up with the idea after he had had difficulty in a shop. "I went to pay and got a bit flustered, and I actually said to the guy behind the counter, 'I've got dementia just let me have a minute' and he just laughed at me and said 'oh yeah I've got that as well'." 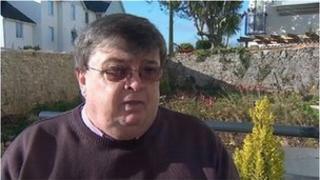 Mr McNamara said the man then apologised but "it's remarks like that which don't help". He said he hopes his proposals could be adopted across Torbay. Chairman of Torbay Council, Derek Mills, said: "[It's] a winner for people with dementia, they'll be able to come to Torbay knowing that people in Torbay are aware of of it and they'll feel comfortable and we can benefit from that as a resort." But Matthew Clarke, who runs a book and chocolate shop in Paignton, said although he supports the idea, care needs to be taken not to offend customers or wrongly assume they have dementia. "We do have customers who come in and order books on a repeated basis, we don't know whether they're just forgetful or whether they have dementia and it's not our business to ask them," said Mr Clarke.